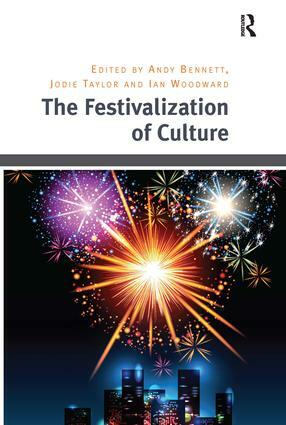 The Festivalization of Culture explores the links between various local and global cultures, communities, identities and lifestyle narratives as they are both constructed and experienced in the festival context. Drawing on a wide range of case studies from Australia and Europe, festivals are examined as sites for the performance and critique of lifestyle, identity and cultural politics; as vehicles for the mobilization and cementation of local and global communities; and as spatio-temporal events that inspire and determine meaning in people's lives. Investigating the manner in which festivals are no longer merely periodic, cultural, religious or historical events within communities, but rather a popular means through which citizens consume and experience culture, this book also sheds light on the increasing diversity of contemporary societies and the role played by festivals as sites of cohesion, cultural critique and social mobility. As such, this book will be of interest to those working in areas such as the sociology, consumption and commodification of culture, social and cultural geography, anthropology, cultural studies and popular music studies. Andy Bennett is Director of the Griffith Centre for Cultural Research at Griffith University, Australia, editor of Remembering Woodstock, and co-editor of Music, Space and Place, and Britpop and the English Music Tradition. Jodie Taylor is Research Fellow at the Griffith Centre for Cultural Research at Griffith University, Australia. Ian Woodward is Senior Lecturer and Deputy Director of the Griffith Centre for Cultural Research at Griffith University, Australia.